I did a bunch of organizing of digital pictures today and I came across the picture shown above. I took it last summer in Paris. I was there giving some lectures during the week, and on Saturday I spent a long day wandering around the city. It was slightly cool and the sky was fantastic. It was cold for the Parisians, but it was perfect for me. After a month in hot and polluted Beijing, an unusally cool Paris day was great. 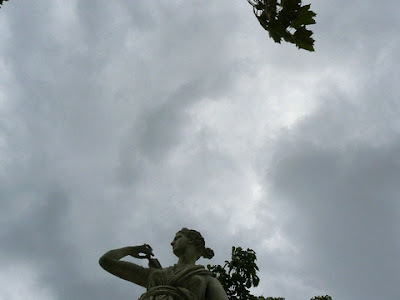 I took a lot of pictures of statues that day, trying to get more of the sky than the statue in the frame. The sky today was kinda like it was that day in Paris. Although after that, the similarities end. No museums or cathedrals or great food today. But I did go for a run outside under the grey sky. The run was very slow, but still somewhat satisfying. I also planted some sweet peas, did laundry and dishes, and did some things around the yard. It rained a little this evening, and it was somewhat cool so I built a fire. Flowers are slowly blooming in our yard. It looks like spring is really here. There's a nice interview and article about Juan Pablo Hoffmaister, who graduated from College of the Atlantic last year. I'm about to migrate hornacek.coa.edu to a new machine. Email and web services may be down for a little while. Update: 9:50pm and I think everything major is working now. I seem to be able to accept incoming email and email out. And so far as I can tell my web pages are fully accessible, except for some CGI stuff. So far, I'm quite pleased with my new machine. I think I'm having some mild springtime allergies. I've had a headache and a scratchy throat today. The last two nights I've heard spring peepers both on campus and by my house. I'm more tired than I think I should be. Might be allergies. Lots of bulbs are pushing their way up in our yard. A few early daffodils have bloomed. The rest are at least a week away. In the unlikely event you were wondering... I have been informed that the grim smell of last week was actually due to a decaying deer head, not a decaying raccoon. In other scent news: the air smelled like spring today and I thought I smelled something like flowers outside. Last Friday there was a grim, decaying odor in the main portion of Turrets, the building where my office is and where I teach. Apparently there was a mishap with the beetle box. What's a beetle box? It's, well, a box full of beetles into which animal carcasses are placed. The beetles then eat the flesh, leaving behind bones. And I guess bones are good for science or taxidermy or Halloween costumes or something. Someone put a raccoon in the beetle box, and then put the beetle box a little too close to the furnace, and so the grim decaying odors made it into the ventilation system. Fantastic. Twice last week there was a bizarre smell in the sink near my office. Half of the smell was coffee, but the other half was tough to describe. Maybe macaroni-and-cheese flavored coffee? I suspect that someone in the business office has been experimenting with coffee flavors. Saturday morning in our house it smelled like someone had been burning incense. It was very odd. Neither Doreen nor I could figure out what it was. Fortunately, it only lasted around 45 minutes. I'm not at all a fan of incense. It was kinda Sandalwood-esque, and I don't like Sandalwood. Bizarre, and a little bit spooky. It's been a good week for College of the Atlantic. Two students of ours won Barry M. Goldwater scholarships. This is a highly competitive, merit-based scholarship, awarded via a national competition, to recognize and support students who indend to pursue science, mathematics, or engineering. Two of our students won Udall Scholarships. Two other students won honorable mentions. The Udall Scholarship is a national competition; awards are made to students who have demonstrated commitment to careers related to the environment. Having two scholars and two honorable mentions is pretty amazing. And, in perhaps the most exciting news of all, Nancy Andrews, faculty member in Arts and Design, won a Guggenheim Fellowship.